Tracks has enjoyed a cult following as the surfer’s bible and number one surfing magazine in Australia for over 40 years. Chill out and travel with Australia’s best surf writers and photographers to discover the best surfing destinations around the world – fresh new waves, boundless barrels, long walls, warmer water, exotic locations and hidden gems. Engaging and entertaining, you’ll hear raw, inspirational and personal stories from legendary surfers, keep up with the latest on the pro-circuit in Australia and around the world, be the first to check out the new blood – who’s making a splash, where and why; and be in the know with the latest surfing technology and news from boards to wetsuits and the ultimate wave. This truly is the only magazine for the surfing tragic. 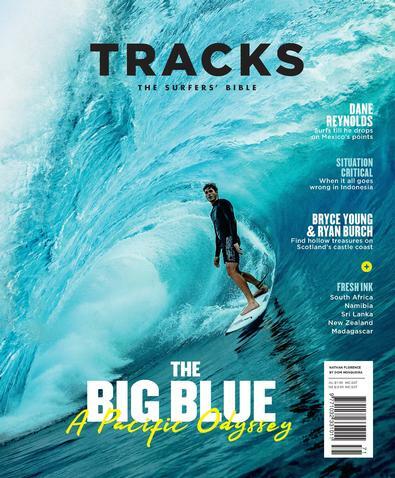 Tracks is Australia's leading Surfing magazine with 40 years of credibility. Every month it takes you to the most exotic surfing locations, fills you in on what's happening on the pro-circuit and at your local beaches. Our demographic isn’t dictated by numbers, isn’t measured by age, or by one’s propensity to wear scarves to the beach during summer. We’re purely a mag for surfers. Full stop. There’s a saying around the Tracks office that “only Tracks could run a story like that” and it’s true. Our stories come from the surfing heartland. They’re topical, soul-searching, inspirational, and occasionally very stupid. Tracks is the surfer's bible. I bought this for my son for Christmas. He is obsessed! I love seeing how excited he is to receive his tracks magazine each month! Would definitely recommend to other mums with sons who love surfing. It&apos;s worth every cent! I buy Tracks magazine subscriptions for my two sons each christmas and they love it! they are both surf mad so it is the perfect gift. This is published 7 times per year, please allow up to 6-9 weeks for your first delivery. Your subscription will begin with the next available issue.